You wanted it. You got it. 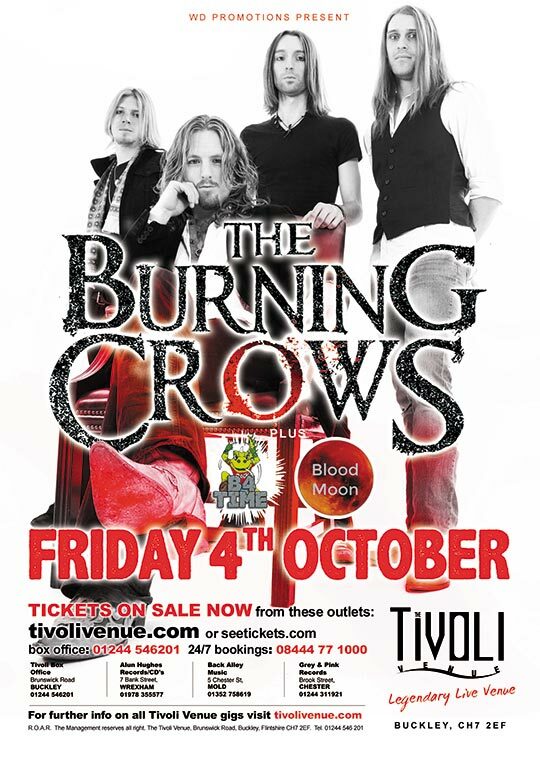 The Burning Crows are back with a run of One Night Only shows in 2019/20… and The Tivoli Venue has been selected especially for one of them! Showcasing a sound rooted firmly in old time rock n’ roll but with an attitude, style & swagger all their own, The Burning Crows have earned the reputation of being one of the very best live bands on the scene today. With two critically acclaimed studio albums, a live album, EP’s, singles, videos and numerous national tours & festivals, the band have proved time and time again that in an industry now governed by buy-ons, backhanders and bullsh*t, you can still do it your own way and on your own terms. Following the amazing public and media reaction to the release of their first EP, “Never Had It So Good”, the subsequent headline tour of the UK & Ireland, a slot at Hard Rock Hell and featuring as special guests to The Quireboys throughout their winter tour, bravado rock n rollers, The Burning Crows, couldn’t have asked for a better 2012. After an overwhelming demand for more, the band returned to the world famous Rockfield Studios in Wales, to once again working with legendary producer Nick Brine (The Darkness, Bruce Springsteen, Oasis) to record ‘Behind The Veil’. Funded in part through a successful PledgeMusic campaign which achieved over 154% of its goal, the album was released in Summer 2013, supported by a number of music videos, highbrow shows and has since earned rave reviews from both fans and the media alike. Not content to wait until they returned to the studio again, the band also released a limited edition live album ‘LIVE …From Behind The Veil’ in 2014, limited to just 500 signed discs and following the success of the release embarked upon UK tours with both Falling Red and Sweden’s Dust Bowl Jokies. There truly is no rest for the wicked however and following a second PledgeMusic project, which subsequently exceeded all expectations by reaching it’s goal in less than a week and exceeding 250% of target at completion, the band returned to Rockfield Studios to once again working with Nick Brine and record their sophomore album, ‘Murder At The Gin House’. Quickly earning critical acclaim in the mainstream and independent media, the release led to a full UK Tour in 2016 with most venues selling out in just a few days. The band closed the year with more festivals and a hometown show to 1500 fans before taking a long overdue break. Now, finally returned from the pub and for ‘One Night Only’, The Burning Crows are back.